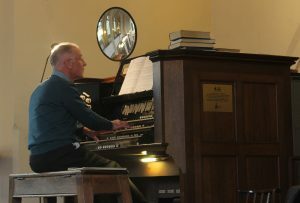 There was a large and varied audience for this much anticipated concert, comprising musicians and visitors of all ages. Could we have guessed what versatility and talent would be shown?! 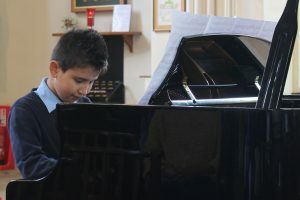 This was truly a keyboard extravaganza which covered a wide range of compositions, emotions and musical connections. 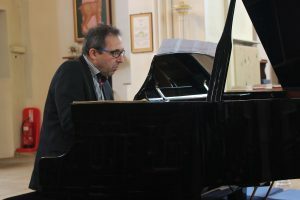 Joe Laredo began the concert with a powerful performance of Mozart’s Adagio in B minor – the clarity of the notes taking us into the heart of this sombre piece. As a late Mozart composition, there was a gravity and certainty in this adagio, and an undertone of wistfulness. A very memorable piece which was followed by Schubert’s Impromptu No.2 in E flat, a delightful composition which showcased Joe’s skill and Schubert’s delicacy of touch alongside robustness at the core. The melody was both enticing and exciting for the audience. David Scrutton followed and, if this was a first public performance on the pipe organ, we definitely hope there will be many more! 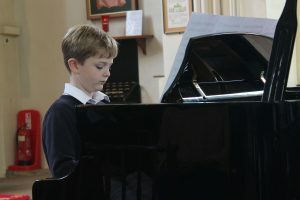 David showed control and skill as he performed two contrasting pieces by Bach, the first majestic, the second jubilant, filling the church space with wonderful sound. His final piece, by Elgar, revealed David’s ability to convey a more delicate and gentler composition. Bravo, David, for showing us your progress. Next, we heard from William Roberts, John Williams and Eddie Hughes, all from local schools, who gave sensational performances ranging from Gospel to Haydn. The skill and expertise of these young performers was inspiring and their contribution to the concert greatly appreciated, as shown in the lengthy and well deserved applause they received. Joe concluded the concert with Francis Thomé’s ‘Simple Aveu’, which showed the piece’s entreating and assertive nuances, and then a sharply contrasting tango, both fiery and passionate – a very fitting way in which to end this rewarding musical session. Many thanks to Lesley for organising the concert and to Fiona and Jean for supplying welcome refreshments.